How do I install wood shutters on a brick house? I've built some Board-N-Batten shutters and am ready to hang them on the house. However, I've never installed shutters before, so I want to be sure I install them properly. Do I drill pilot holes in the wood first? Pilot holes into wood and brick of my house? Or do I drill the screws through the wood and into the brick all at the same time? If I do it this way, I'm just afraid the shutters will shift & not hang properly when I am drilling. What exactly is the accepted procedure for installing shutters? Also, what type of screws are recommended for this sort of install? If you want to use a screw I would use Tapcon® Concrete Screws. They hold very well and are fairly easy to use. The only draw back is that they are a bright blue and you will have to countersink them and caulk or plugged the hole. 3/16 inch will be strong enough, you will want about 1.5" of penetration. To install you just drill a hole matching the size of the screw (needs to be exact size required) and screw them in. 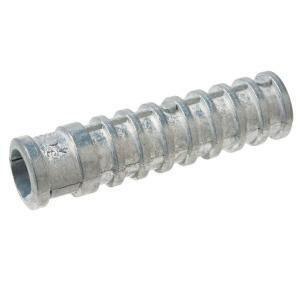 Using a screw is helpful because its about the only concrete anchor you can easily remove. The other option is Metal Hit Anchors. These are a nail in a sleeve. you pre drill the hole and hammer the anchor in and the nail expands the sleeve. 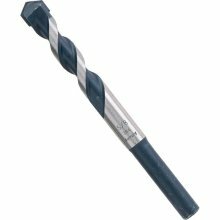 Any time you drill into masonry you should be using a hammer drill, and a masonry bit that is specifically designed to be used with a hammer drill. On most brick homes anchoring into the brick is going to be stronger. But it is only shutters and you could get away with drilling into the mortar. This way if you ever want to take the shutters down you can fix the hole in the mortar, unlike if you were to drill directly into the brick. Measure, level and mark boards, appropriately aligning the future holes with the mortar between bricks. Drill pilot holes into the wood shutters, including a 1/4" countersink to cover the screw heads up with wood filler. Set the shutter down and drill the top two mortar holes completely. What I learned at this step: Be sure to drill into the mortar enough to where the screw tip won't hit a dead-end (Most recommended a 1/16" or 1/4" of extra room beyond the screw tip). If you don't give a little extra space at the tip, you'll encounter a great deal of resistance, the screw will not go in all the way and you'll have to get the masonry bit out again. Attach the shutter to the house using the top two holes. Now, we'll finish the bottom two holes: with your masonry bit, drill into the mortar through the board. What I learned at this step: I found this process to be the easiest for me, as my pilot holes didn't always match up completely when I attempted marking then drilling all four at the same time. Less margin of error on my part. But, this is became a personal preference. Decide for yourself. Finish attaching the shutter to the mortar at the bottom with your screws. Use wood filler to patch the holes, lightly sand filler. What I learned at this step: I had already applied a sealer to the back of the shutters before attaching them. I taped off my house using wide painter's tape after they were up and it saved me a huge headache of cleaning sealer off my house with mineral spirits. I marked & drilled all of the pilot holes into the shutters at one time which saved me on having to switch between the masonry & wood drill bits. HINT: If you forget to take out the masonry bit and attempt to drill into wood, you very likely could start a friction fire! :D Haha! Having two drills is a life-saver: I had my hammer drill set up with my masonry bit and my cordless drill had my Phillips bit in it ready for the screws. Having a second pair of hands throughout the entire process was also a great deal of help. Thanks for your help folks! I hope this little walk-through helps someone else, too! I haven't had to do this myself, so this is all theory. I'd welcome any suggestions to this. This also assumes these are non-functional shutters. First, test fit your shutter, determine where you want the bolts to go. I'd aim for the mortar, since, as Justin says, this lets to fix any holes in the future. I don't think you'll see anywhere near the load that would require going into the brick. This lets you remove, paint/repair, and replace the shutters without changing the hole you made in the wall. When installing, use some lag bolts with washers or a large head that allow you to adjust the fit if one hole isn't well aligned. Make sure to always use like metals (anchor, bolt, and washer) to avoid any chemical reactions. And when done, cover the bolt/screws with a bit of paint so they blend in. One last thought, wood against masonry is a rot situation waiting to happen. Paint or seal all sides of the shutters, and then put something on the back of the shutters near each of the pilot holes, or run the bolts through a couple thick washers or spacer, to keep the shutters off of the wall slightly and allow air to pass behind them. Not the answer you're looking for? Browse other questions tagged windows installation shutters or ask your own question. What masonry anchor should I use to install both window boxes and shutters into brick? Is it normal for uPVC window shutters to be pre-fitted to the frame at the factory or not? How can I extract broken off shutter-lok fasteners from brick? How to remove broken shutter fasteners from brick? How can I bolt a microwave to the upper cabinet if the bolt hole is stripped?